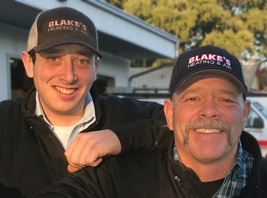 Blake’s Heating and Air Conditioning is family owned and operated and has been serving Yolo and Solano counties since 1973. We are the oldest Lennox dealer in Northern California with one of the the oldest heating and air contractors license. Blake’s is one of the few companies still charging hourly rates for service as when the company was founded. We charge for materials and labor only. Our estimators and technicians are not commissioned so their concern is what is best for our customers. We treat our customers well and they in turn give us the best advertising, word of mouth. Call us today at 530.758.4030 or send us an email at leslie@blakeshvac.com.